QUALITY SUITES SAN DIEGO SEAWORLD AREA The Quality Suites® San Diego SeaWorld Area puts you in the heart of San Diego. Hotels in the area are centrally located near Old Town San Diego and its historic Gaslamp District. 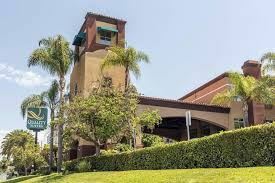 At this Quality Suites San Diego hotel you will also be just a short drive from popular attractions like: Petco Park Old Town San Diego State Historic Park Balboa Park San Diego Zoo San Diego Convention Center Our amenities offer so much value you’ll feel like you’ve struck a bargain. Enjoy our outdoor heated pool with whirlpool or exercise in the fitness center and enjoy our other amenities that give you more value for your hard-earned money: Free hot breakfast Free WiFi Outdoor pool and hot tub Fitness center Marketplace Get going with a great breakfast. Hotels in San Diego like this Quality Suites start your day off with a free hot breakfast offering everything from eggs, waffles and meat to healthy options like yogurt and fresh fruit. With our two-room suites, enjoy a private bedroom with a king or two double beds and a living room separated by French doors, plus sofa sleepers, microwaves, refrigerators and two flat-screen TVs. Traveling with children? At this family hotel, our kids' suites include a private room with bunk beds, flat-screen TVs and an activity table. Keep your electronic devices charged with the recharge device including AC and USB outlets provided in all guest rooms. You can depend on us for affordable hotels with all the amenities you expect and genuine service from people who are professional, responsive and friendly. The San Diego SeaWorld Area offers the best hotel rates and the best amenities, too, so you can focus on the travel memories that really matter. Book now! Meeting space is available from 11:30AM to 10:00PM. This space is best for small gatherings: meeting, workshops, baby shower, birthday celebrations, luncheons. etc. Our Property will provide complimentary WiFi, Coffee, Tea. Quality Suites San Diego SeaWorld Area provides meeting facilities which are perfect for small groups and corporate retreats, and our central location allows corporate travelers to enjoy all the sights and sounds of San Diego and still be conveniently located to San Diego's business community. Our 644 sq ft. multi-use room is perfect for small meetings. Attendees can enjoy the beautiful courtyard during breaks and the breakfast bar area is a convenient spot to offer refreshments or meals. Atmosphere/Decor: As we are located so close to the theme parks like San Diego Zoo and SeaWorld we have artwork displaying images related to these two locations in our meeting area. Very bright and comforting. Special Features: Complimentary Wifi, Coffee and Tea Available. Parking is Discounted.